This made the rounds on social media recently. Here's the last page of Amazing Spider-Man #122, "The Goblin's Last Stand," from 1973. 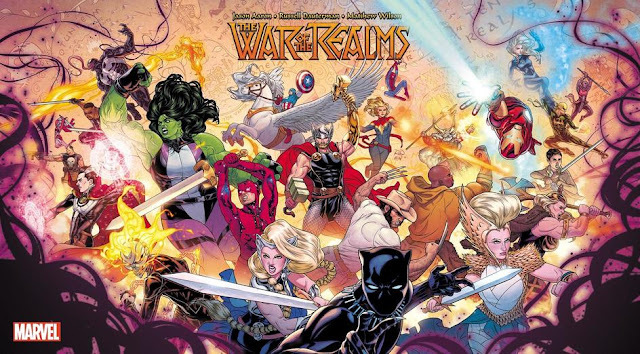 It was written by Gerry Conway and drawn by Gil Kane. This is the ending to one of the seminal Spider-Man stories, "The Night Gwen Stacy Died." 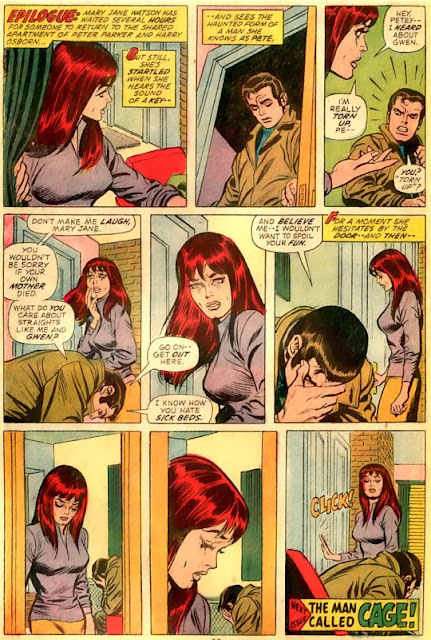 After taking down the Green Goblin (who accidentally kills himself), Peter goes back to his apartment to see Mary Jane Watson. MJ at this point had been portrayed pretty one-dimensionally, always looking for a party and treating her friends as not much more than collateral to having a good time. I believe that up to this point, though I could be wrong, she had had all of one thought balloon throughout her appearances. So even Peter, her friend who's grieving, thinks she's this thoughtless, uncaring individual. That slight pause before she closes the door makes the final panel all the more powerful, used by Peter/MJ 'shippers as a moment that encapsulates their whole relationship. Certainly, it started a whole development of MJ's character that didn't stop, regardless of whether or not you believed said development was for better or worse. Which is what makes this next bit so fascinating to me. Here are the original layouts, before Gerry Conway asked John Romita (then Marvel's art director), to change it to the final published sequence. Now, that's interesting. The first five panels would have been exactly the same, but instead of almost walking out the door and changing her mind, she goes to visibly hug Peter, with the final panel being the two of them hugging through his apartment window. It's completely different. This being a 70s comic, there probably would have been huge blocks of text as well explaining how she's wrong about him, that she's there for him, and all that whatnot. (That's another thing that makes the final published piece huge for its time — silent sequences were rare). It was a more effective transition into adding layers to the one-dimensional Mary Jane Watson than, I believe, the original layout would have been. Her defensive mechanisms go up, but she doesn't give into it, and yeah, maybe a part of it is just to prove Peter wrong. And maybe she doesn't hug him when she closes that door. Maybe she holds his hand. Maybe she sits beside him for hours. We don't know. Sometimes not showing us is better than showing us and telling us. Sometimes not showing us is what makes these things work. I must admit, as a 10 year old kid reading that story for the first time, brand new for two dimes and a penny tax, I found that ending sequence a little confusing, because of that very ambiguity. Later, of course, it made obvious sense. In my head, I can also imagine the remainder of the scene. Still makes me rather teary-eyed, even 44 years later.